Kelly Osbourne and Lady Gaga have been wearing a bona fide icecream palette for several seasons, but it wasn’t until the BAFTA 2013 red carpet event when January Jones (nee 1978) enchanted onlookers with ribbons of carnation pink running through her wavy bob, and Helen Mirren (nee 1945) created a photo frenzy with her solid medley of rose and violet strands, that pastels changed from being an avant-garde expression to a mainstream trend. 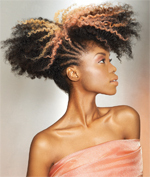 NAHA 2013 Finalists took full advantage of the pastel trend. While pastels can be quite dramatic, choosing diluted shades and using delicate application techniques can thrill classic clients who want to flirt with fashion colors, while staying true to their beauty personalities. “Like training wheels for timid color clients, muted pastel shades can fit the bill for those who are looking for more subtle ways to be fashionable and on trend,” says indie artist Sherri Jessee. “For clients who prefer classic haircuts, these softer shades can also make everything from traditional bobs to long layers new again. 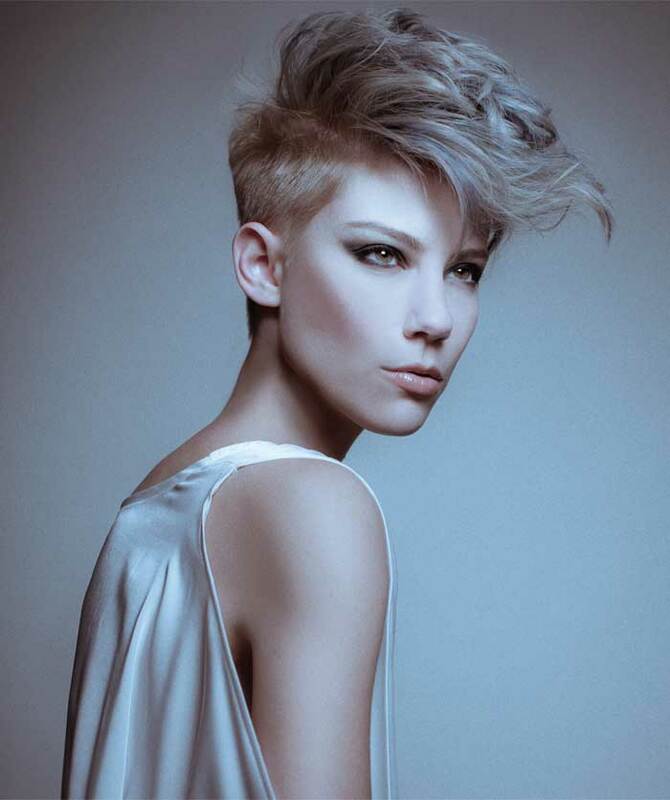 Creating a multi-tonal blonde will enhance your pastel designs. Create the pastel shades of your clients’ dreams in as little as 15 minutes. 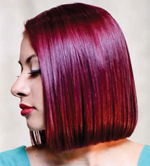 Scruples URBAN SHOCK Color Craze, which has a direct-dye system with a conditioning base, includes seven intense colors: Red, Blue, Purple, Pink, Orange, Green, and Yellow. All colors can be diluted with Scruples Pearlscriptives ER (Emergency Repair Conditioner) to create beautiful pastels. 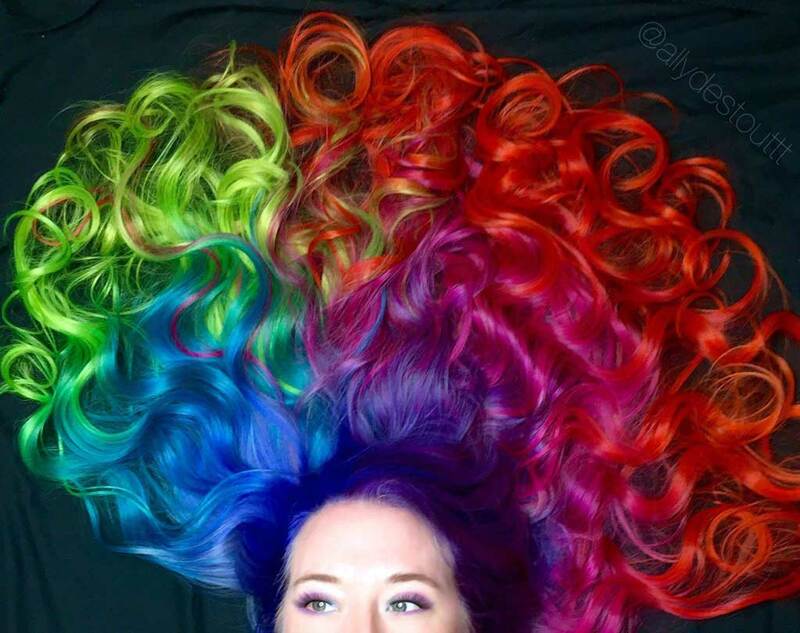 This method offers complete artistic freedom when creating ombré, tie-dyed and tipping techniques, by using one or more colors in various stages of dilution. Starting on light-blonde hair, find the natural top part. Create seven small triangle sections—four on the heavy side and three on the lighter side of the part (shown). 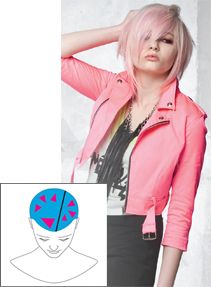 Apply Scruples URBAN SHOCK Color Craze Pastel Pink within the triangles, using foils and backto- back slices. 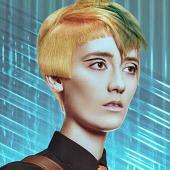 Matrix Artistic Educator Todd Kane is a NAHA Newcomer finalist, thanks in part to this fabulous image, which was done using Matrix Color Sync demi-permanent color. Pre-lighten hair to pale yellow from roots to tips in areas where pastel accents will be placed. Rinse thoroughly with cool water and towel-dry the hair. Divide the pre-lightened section into three parts. 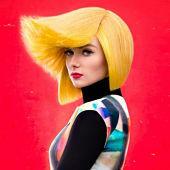 Using foiled slices, apply Matrix Color Sync Accent formulas. 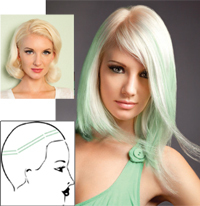 With only two rows of slices encircling the head, this quick color placement provides splashes of mint on a pale-blonde canvas, which can appear subtle to slightly more intense, depending on how you style the hair. Pre-lighten hair to level 10 from root to tip, either all over or where pastels will be applied. Create two circular rows, starting 1” from the front hairline, moving back and around the top of the occipital and up the other side. Rows should be about 1” apart. Taking very fine slices, apply Pravana Mystic Mint ChromaSilk Pastels, leaving a 1” margin in-between foiled sections (shown). Gently feather the color, starting 1” from the hairline down to the ends. Process for 20 minutes and shampoo each foil separately to avoid unwanted color transference. There’s a perfect pastel for everyone, even your most conservative client. 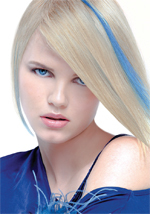 Do you have clients who love pastels, but still want a believable haircolor? Using a technique called “Heartbeat,” arteasecolors has just introduced one of the most sophisticated pastel applications—ever. “For the model that accompanies this article, violets were combined with cool golden blonde hues, which kept them in the same family,” explains Gerd Hoher, Master Colorist and President of arteasecolors. “We also made sure that none of the colors were too far apart in terms of levels. “Pastels are so soft and feminine, that clients of all ages are welcoming the opportunity to wear fashion statements that go beautifully with summer clothing and makeup,” says Vikki Parman, CEO and Master Educator for Di Biase Hair USA. “Using your color wheel, level 10 extensions and pure pigments, you can create everything from soft apricot and pale yellow, to sky blue, mint green and all other pastel colorations. Deep pastels resonate with rich brunettes. Highlights: 1 scoop Blue Naturlite Lightening Powder, 2 pumps Violet Intensifier + 2 scoops 10-volume OCS Cream Developer. Toner: 1 oz. 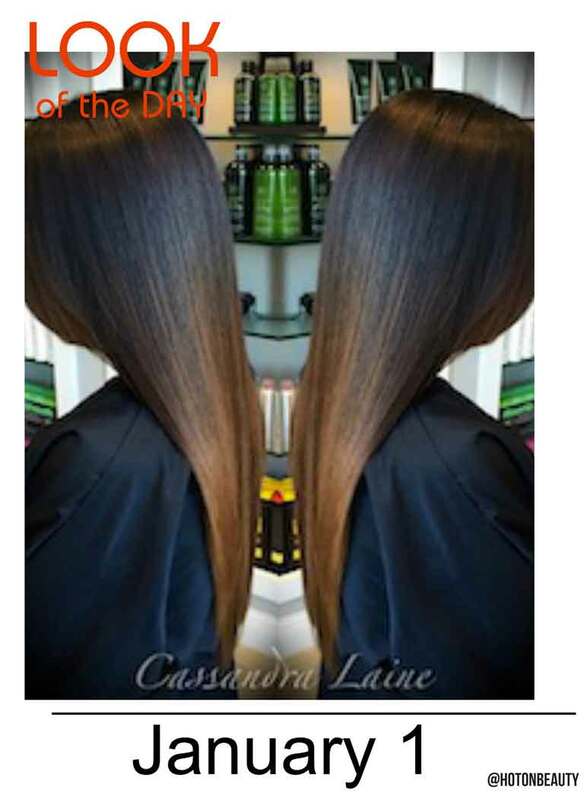 7MH (Medium Mahogany Blonde), 3 pumps of Violet Intensifier + 1 oz. 10-volume Hairmonics Developer. Taking back-to-back foiled slices across the top of the head, apply Highlight formula. 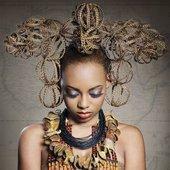 While processing, apply Base formula to remaining hair. Process until Base color is developed and foiled highlights are yellow (no gold present). Rinse base color, then remove one foil at a time and rinse. Lightly cleanse and moisturize, towel dry and apply Toner to the entire head. Keratin Complex Color Therapy has just launched its Hologram collection, which features a bevy of muted pastels to vibrant shades and designs. When designing pastel haircolors—from formulations to placements—remember that most clients have a hard time articulating their desires. To create the right formulas and results, it’s important to fi rst ask whether they want their blue, apricot or lavender to whisper, speak or scream. (These are good metaphors to use for all color consultations.) Their response will let you know whether you should mutedown or pump-up the targeted shades, as well as the most pleasing way to apply and place the colors. “When creating a pastel from scratch, you not only need to follow the color wheel, but also imagine that you’re a painter,” Gavin continues. “If you want to add a pale rose pastel to your canvas, for instance, you would use a combination of white and red-violet paints. 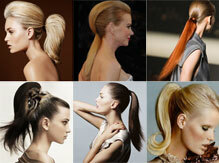 For haircolor, which shades in your line mimics these hues? For me, it would be Keratin Complex KeraHold 10.28/10VP (Ultra-Light Violet Pearl Blonde) and 6.62/6RV (Dark Red Violet Blonde). Deborah Gavin, International Artistic Director for Keratin Complex Color Therapy, takes a delicate touch with pastels for Hologram, the company’s newest and most breathtaking collection to date. A fascinating interview with Gavin and complete formulas for all Hologram, images are on our website! 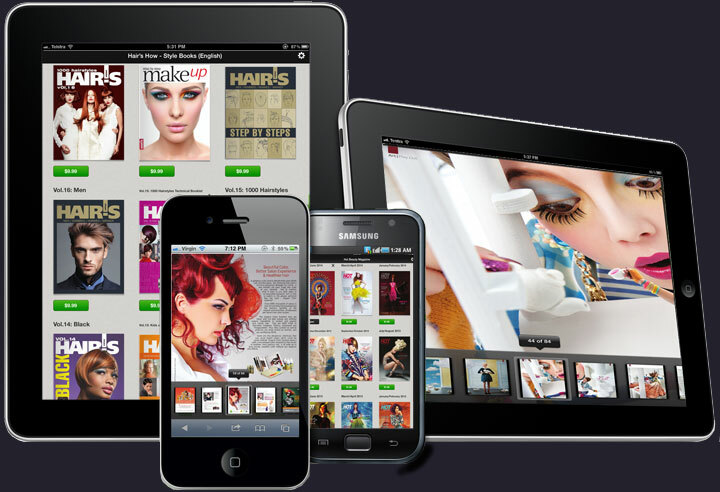 Hot.HairsHow.us.